Super Hero Boy: Robin Hood SeasonThree from the BBC is Robin Hood in a way you've never seen him. Robin Hood SeasonThree from the BBC is Robin Hood in a way you've never seen him. Everyone has different ideals about Robin Hood.. from the childhood story of the merry hero stealing from the rich and giving to the poor to more romantic versions of the love story between Robin and Marian. What happens though when you depict Robin Hood in a more realistic light and Marian has been killed? 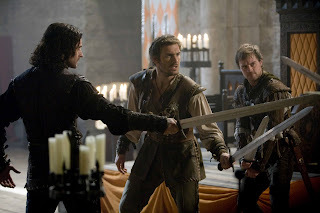 The BBC's Thrid and Final season of Robin Hood is actually fantastic. I never saw season one or two but I'm planning on going back and watching them now.. actually I only watched the first three episodes off this dvd set as I don't want to totally ruin the story for myself while I go back and watch the others. The series itself is very visually appealing but teh actors are not overly attractive like you would find in a US born series. Actually for this reason alone the whole story seems more compelling as we are talking about the middle ages people. As you can imagine with the death of Marian in season two it appears, Robin Hood is not the merry thief you would expect from legends. He's out for revenge and the Sheriff is on the top of his list.. the only problem is he's really not in a great place at the start of the series mentally as he is grieving pretty terribly for Marian. The characters are not the same ones you'd expect as well including one of the main characters is a girl named Kate who they just seem to pick up from Locksley. Over all it's one of the most adult most realistic Robin Hood adaptations I've seen. If you've never experienced a BBC series or thought they were all cheezy you'll be very pleasantly surprised by this series. It's a great addition to any fantasy collection and one of my favorite that I've seen in awhile as so often so many of the fantasy series I've seen end up either way over the top as far as fantasy goes where everything and everyone is just so ridiculously attractive (not at all the way things would have been in the middle ages) or downright goofy. Now I just need to get Robin Hood Season on and Robin Hood Season Two so I can start from the beginning! 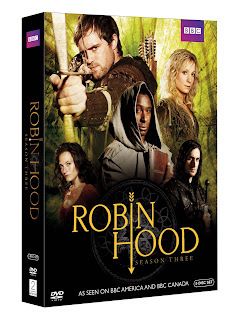 You can pick up your own copy of Robin Hood Season Three on Amazon right now!